Interprofessional Kudos from Dr. Stratton! “Kudos to the 17 Duluth PharmD Students who teamed with 1st or 2nd-year Duluth Med Students to work up and present “mystery cases” in the Med School’s Clinical Pathology Conference (CPC) course this past year. Each team of 2 PharmD students and 4-8 Med Students was given a patient case describing only the patient’s presenting complaint and symptoms. The team then came up with a diagnosis and treatment plan, created a 20-30 minute Power Point presentation describing their case, and presented the case to a class of Med Students and faculty from both the Medical School and College of Pharmacy. Each team then fielded questions about the case from the audience. Student Pharmacists from the College of Pharmacy in Duluth have participated in these interprofessional sessions since 2006. Although the Med Students present these cases as part of a course assignment, Student Pharmacists participate strictly on a volunteer basis for their own professional development. 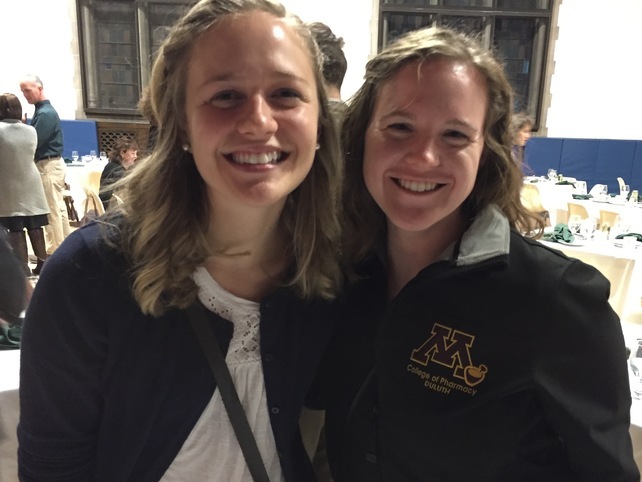 Over the years, several PharmD students have volunteered to participate in more than one case, while other years we have a waiting list of PharmD students wanting to take part. Both of these situations speak to the value that Student Pharmacists place on this activity. Students and faculty from the Medical School are also always appreciative of the contributions that the PharmD students make to the case workups and presentations. Okay, it isn’t quite our last day of school (or the semester) yet, we still have 6 more months before we get to leave the classroom forever and start rotations. Today was our last day of lab!!! To help us celebrate our lab professor even brought us cookies! 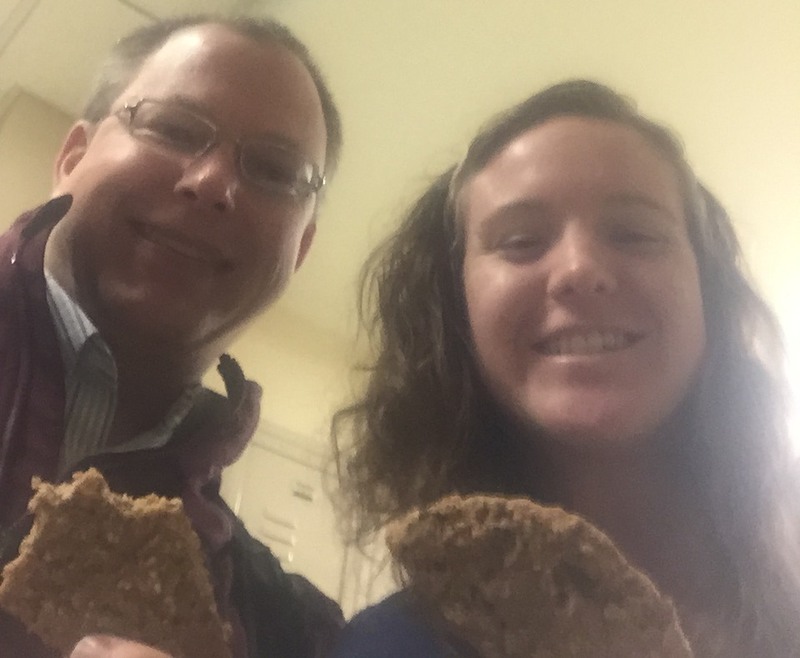 My classmate Todd and I enjoying our cookies after class! 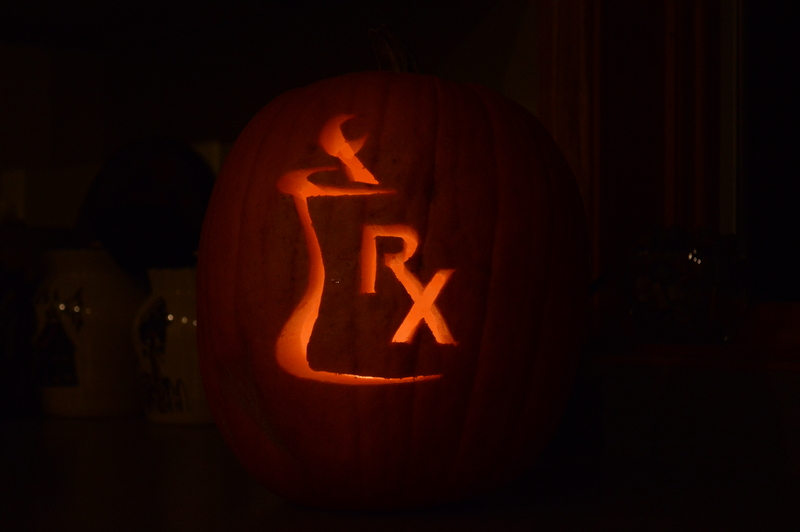 What pharmacy students like to carve in their pumpkins! You Can Go Surfing on Lake Superior! Okay, maybe if I was actually a surfer, this would entice me to come to Duluth for a weekend. 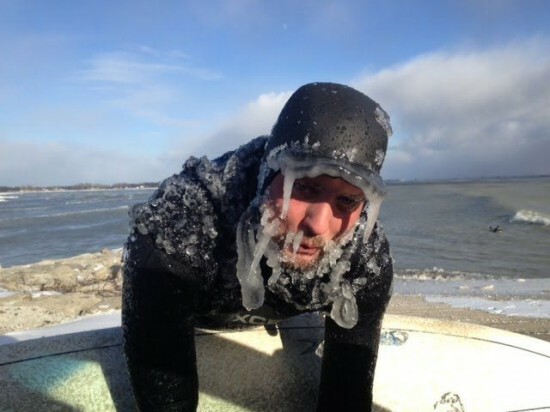 (There are things I enjoy about winter, icicles hanging off of my face just doesn’t happen to be one of them). 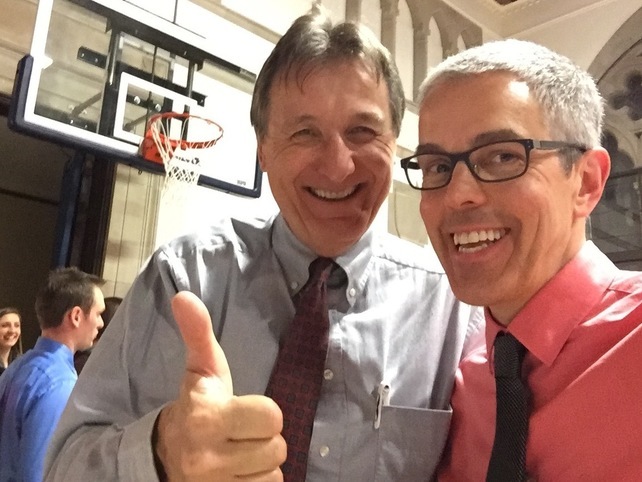 However, lucky for us, it was a good enough reason for Dr. Peter Kreeft to come to Duluth and speak at the annual White Mass that is put on by the Catholic Medical Association (CMA) here in Duluth! I have greatly enjoyed the opportunity to be involved in the CMA during the last two and a half years, and it makes me sad that this may be my last White Mass until after graduation depending on where I end up for rotations. Getting the opportunity to get together with other health care professionals who share my faith has been a Godsend during some rough weeks over the last few years! It has given me tools to help me integrate my faith into my life and career in the future (while remaining respectful of others’), as well as helping define my own values and beliefs so that I have a better sense of what I would be comfortable doing/not doing as a health care professional. 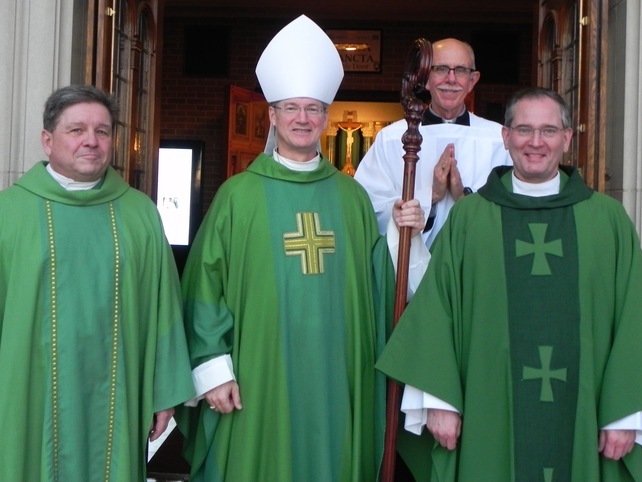 From left to right: Dr./Deacon Egan, Bishop Sirba, Deacon Brannan, and Father Muhich. Their support helps make St. Raphael’s Guild and the White Mass possible! It has also been really amazing to watch the Guild grow over the last two years and has given me a great appreciation for how much persistence you sometimes need when leading change in the real world! Especially since it is sometimes hard to see the long term changes you are making to organizations in pharmacy school since we are only on campus for three years and the leaders of the organizations are often in the leadership role for a year or maybe two. This year the White Mass was the most highly attended that I had seen (tickets for the dinner after actually sold out! ), and it was really inspiring to see a such a large inter-professional group of health care providers come together outside of the hospital/clinic setting! Remember in elementary school when Flu season meant substitute teachers, half the class out sick, and staying home watching cartoons? In Pharmacy School, Flu season means the start of immunization season. For my classmates who work in community pharmacies while in school, it means getting to give a lot of vaccines, which we learned how to do at the end of our PD1 year. Since I do not work in a retail setting, I signed up for the Immunization elective, which involves learning how to set up an immunization clinic and participating in the Immunization clinic that health services puts on at UMD for students, faculty, and staff. Last night we had our training so we know the different roles and jobs that we will be doing for the immunization clinic. We also ran through different scenarios to practice what to do if someone is really nervous about getting their flu shot, faints, etc. At the end we got to give each other our flu shots. We also had a surprise visitor at the end of our session! 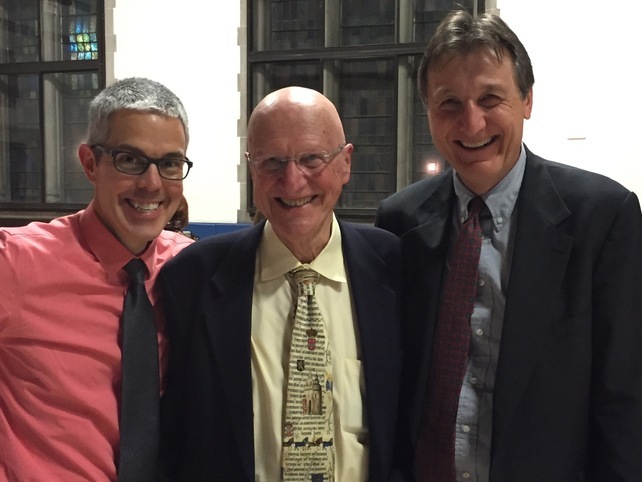 Our own Dean Seifert! 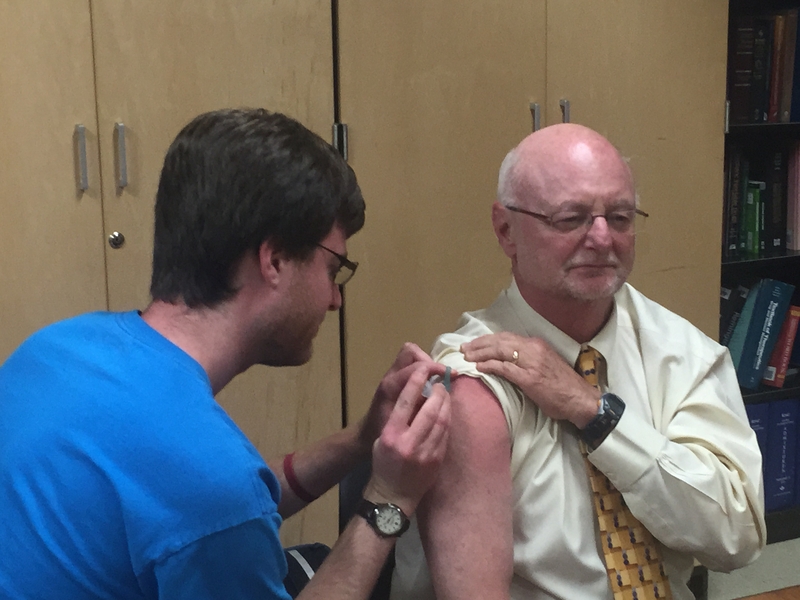 My classmate, Alex, bravely volunteered to give the Dean his flu shot! I can’t believe summer is almost over…..literally over…. Forever. Not that it won’t ever be 90 degree humidity with 80% humidity because I’m sure it will, but that I won’t ever have a defined summer break ever again. But I guess that is part of coming to age and I’m glad I got at least three more summer breaks than many. Despite busy with work, research and running, I do appreciate having some time to refresh and renew before my last year of the classroom ever begins. Because I’m so incredibly refreshed and renewed, I have the mental energy to come up with crazy ideas (for anyone familiar with Strengthsfinder, one of my signature strengths is ideation) because I’m not using that mental energy to try to know it all in the world of pharmacy school. And extended analogies are definitely the epitome of truly maximizing my ideation strength since it is combining seemingly completely disparate ideas into something that sorta kinda works . So that is what I’m going to do. I try to pretend I’m up with the times so I try to make myself at least literate in all the newest crazes. I think the craze I have become probably the most literate in, with the littlest relative amount of experience in, is Pokémon Go. So, based on my extensive research of the game (a.k.a probably 10 Buzzfeed articles), coupled with my 5 minutes of real life experience (and my 2 year real life experience in pharmacy school that is) I am going to liken the game Pokémon Go to pharmacy school (aka PharmaMon) where we gotta, or at least try to, know ‘em all. What are em’?…. Drugs of course. Decide to read this or not (really, I’m doing it for my own amusement so I won’t be offended), but if anything just take a moment to appreciate the logo for my blog post that was a lot harder than one would think to create….. much harder than the writing part. Pokémon Go has made a lot people more active, and encouraged them to see the world In order to escape studying for a bit I love to procrastinate ( and refresh my mind) by going outside to get some fresh air and some blood moving, very similar to how Pokémon Go has inspired so many people to get out and get moving! I’ve heard jokes that the game is a conspiracy of the Department of Health to get people to exercise, which true or not, shows how people are motivated to move in sometimes unexpected ways. Likewise, just as the game has caused people to go explore the world and go to places they would not normally have gone, I have been to Baltimore, Mexico, San Francisco, North Dakota, soon to be Las Vegas, and of course the grand state of Minnesota, all in the name of Pharmacy. Would I have gone to these places otherwise? Maybe some of them… but probably not North Dakota…. Despite being a very nice place I honestly would likely not have ventured there unless I was volunteering there at a pharmacy related activity. I think one of the main reasons I did not seriously pursue Pokémon Go was the desire to not constantly repeat the disheartening experience of being motivated to go catch ‘em all, only find that the server is down. This is a very similar phenomenon I experience all too frequently at both at my apartment and at school when I try to log onto wifi and it fails me. All that motivation I had to send that email or turn in that assignment essentially dissipates into thin air as I turn my main goal in life to getting onto the internet by repeatedly turning on and off wifi until it FINALLY works… and by that time my motivation to be productive usually is gone. That is very similar of an experience to wanting to play Pokémon go only to find the server is down… all motivation to play the game disappears. However the problem is that I don’t make it my goal in life to repeatedly open and close the app to make it work as I do for the wifi… instead I just go on with fulfilling all my real life goals. Pokémon= Drugs I have to learn. Rattata= Tylenol. My short experience playing the game showed me that Rattatas are everywhere. So is Tylenol. Rattatas also look pretty vicious, just as Tylenol can be very vicious on your liver. Snorlax= Lorazepam. Snorlax is always sleeping and has quite a bit of fat stored up. Lorazepam is a fat soluble molecules used as a sedative. Charmeleon= Ticagrelor. Both are orange. Charmeleon burns its enemies, ticagrelor burns blood clots. Mew= Neupogen (filgrastim) . So according to my research Mew’s has DNA that possesses the genetic composition for all Pokémon, allowing it to capitalize on all Pokémon skills. In short, it can be who it wants to be. My best comparison of this is Neupogen, which stimulates the production of stem cells. Like Mew, stem cells can be who they want to be. Eevee= Cefazlin. Eevee is the Pokémon with the most evolution possibilities. When I think of evolution possibilities in the area of drugs, I think of cephalosporins, a class of antiobiotics- we have 1st gen( cefazolin), 2nd gen (Cefoxitin), 3rd gen (Ceftriazone) and 4th gen (Cefapime). This is just like the many evolutions of Eevee… I think she has a bit more evolutions than the generations of cephalosporins but I believe that we will get there one day. Pikachu= the mAbs. I feel a lot of pressure to make one with Pikachu, but I can’t quite think of it at this time. I’ll go with this; Pikachu was my favorite Pokémon as a child and given that I haven’t given it much thought since then I would say by default it is still my favorite. I don’t have a favorite drug… yet… but my favorite class of drugs are the mAbs, the monoclonal antibodies. I just think the fact their remarkable specificity of these drugs represents the closes thing to what we have to the magic bullet, and am constantly amazed with the variety of conditions these drugs can treat. Ok that is all I got for now. That took a lot of mental power, but hopefully all the mental power of pharmacy students and pharmacists alike can try to come up with a drug analogy for EVERY single Pokémon. I’m sure Micromedex DrugDex could be even more fun than it already is with a Pokémon tab where you can see if the drug has a Pokémon equivalent. Anyways, I hope everyone enjoys the rest of their summer and while I could wait a little longer to go back to school and “know ‘em all!”, I am looking forward to what the year will bring! After a fairly draining finals week to cap off an in general fairly draining semester (that is PD2 year for yah! ), I had a nice week where I was able to get my life back together and do normal people things such as get a haircut, work a few 8 hour shifts, and lay around watching TV. Well needed break! Starting on May 23rd, I did my IPPE rotation at the University of Minnesota Masonic Children’s Hospital. I work at the University of Minnesota Medical Center on the East Bank, where I spent about half of my time throughout my three-week rotation. It was a little strange walking around my worksite NOT in scrubs (but also not getting paid either…sad life). That said, I got to shadow all sorts of cool clinical specialties on the east/west banks such as the neonatal ICU, psychiatry, cardiovascular ICU, Pediatric ICU and surgery which is totally different from what I see when I work and an experience I wouldn’t trade for anything. I loved talking to all the pharmacists in these areas, hearing what types of patients they care for, and learning about different drugs for these unique patient populations. Overall, it was a great rotation and I am so grateful I was able to get into Block 1 into this site last moment to accommodate the CTSI Advanced Pathways research program I will participate in later in the summer to accompany the research I will be conducting at Regions Hospital on Bupropion toxicity for my Melendy Scholarship. Throughout this entire time, I was also fairly busy preparing for a class a teach called “Preparing for the PCAT” at the College of Continuing Education. This is a six week course that helps aspiring pharmacy students prepare for surprise surprise, the PCAT. This is my second year teaching the class so it has been exciting to help further develop with the insight I gained from last summer. For instance, this year we rolled out a Moodle site (and I know understand why so many Moodle issues come up in class!) and also created interactive clicker questions for our slides to help reinforce topics. While a ton of work , I am lucky to have a rock-star co-instructor, Karen, and a great group of students to help keep me motivated! It is crazy to believe that my last class is this next Wednesday. Teaching this class has definitely been one of the most challenging experiences I’ve had in pharmacy school but I have learned a ton and it will definitely will help me with any teaching I hope to do in my future. 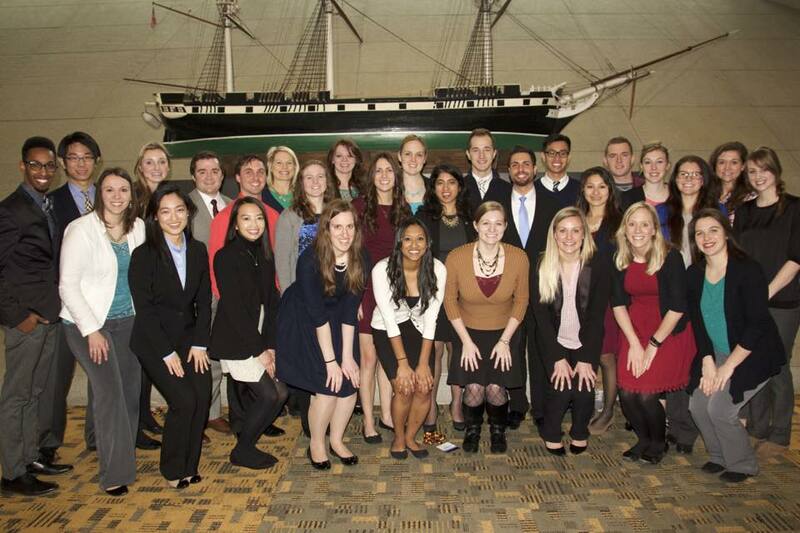 The day after my rotation ended, I hopped on a plane to go to the ASHP (American Society of Health System Pharmacists) annual meeting in Baltimore. You know when you have one of those spontaneous YOLO moments and drop several hundred dollars on something you hope will be worth it? (or maybe you are financially responsible and don’t know as well as I do). Well, that was exactly how me deciding to attend this conference was. I’m pretty sure I was in the trenches of second semester, probably deep in the kidney or Fick’s law, when I decided that I was going to go to Baltimore for the ASHP summer meeting. Usually a lot of my classmates attend the ASHP midyear meeting in December but the summer meeting, which is a little (actually a lot) bit smaller and is focused on the specialties of ambulatory care, medication safety, informtatics & technology and pharmacy,practice& policy, is usually less attended. However, I am very interested in pharmacy informatics so decided I would likely benefit greatly from attending this meeting this year since I can’t say for certain when the meeting rolls around next June (actually in Minneapolis!) that I won’t be in International Falls on 4th year rotation. LITERALLY the best choice I could have ever made. Three of my classmates and I were the only students from Minnesota attending, but we were sure living the dream in Pharmacy world (which is very small, in case you haven’t hear before). We have amazing pharmacy leaders from Minnesota such as faculty member and immediate past president Chris Jolowsky, and new ASHP president Lisa Gersema who is the director at United Hospital. A whole host of other hospital pharmacy directors and managers from the area attended the conference as well so we got wine and dine with all these leaders in Pharamcy as we all enjoyed the sessions, receptions and hearing Lisa Gersema’s inaguaral speech! I was able to meet several informatics pharmacists on both a local and national level and have a few shadowing experiences lined up as a result. I also had never been to Baltimore so had no idea what to expect- however, it was a beautiful city with great restaurants and scenery. I left the conference with so much inspiration and pride for my profession, and so much excitement for my future Can’t really put a dollar sign on that. Moral of the story…. When you have a choice to go to a conference or not…. Just do it. Because of conferences I also have valid excuses to go to Florida, Vegas and San Francisco in the next year. What else are loans for? As I mentioned the impetus for my decision to go to Baltimore was my interest in pharmacy informatics. While I am not sure exactly what I want to do with it yet, I think whatever career path I take I will be able to apply my knowledge of the area. I just applied for the Masters of Health Informatics Program at the U of M that I’ll ideally finish within the next year, before I get my PharmD degree. I took a few of the classes last semester and despite adding to my course-load to make everything a bit more stressful, the classes, which are conveniently all online, are very interesting and have great faculty that were very supportive and helpful in my studies. There are are few formal dual degree programs such as the MPh/PharmD and MBA/PharmD. This is not one of the formal dual degree programs so I’m sort of going rouge on this, but luckily a few of my PD3/PD4 colleagues have taken this path and can give me guidance. The most… uh… questionable admission requirement for me has been that all applicants must having coding experience. As a pharmacy student and biology-nerd for life, I may be able to tell you all about side-effects or pharmacodynamics of codeine, but coding? Who do they think I am? But despite never in my life ever thinking I would have to learn to code, here I am, trying to learn to code. Since getting off of school I’ve taken on a few projects at work and the Phillips Neighborhood Clinic that allow me to have practical applications for my struggle-bus ride into the world of programming, and I must say it has actually been pretty fun (in the nerdiest way possible) despite the fact I usually don’t ever know exactly what I’m doing until I look at least three different online help-forums and get at least 10 error messages. But that moment when your code works is pretty awesome and it’s a good way to help exercise my brain during the summer so it doesn’t turn to mush. I also realize the infinite possible applications for knowing how to do this in literally any job I could have in the future so I’m not complaining. Hopefully come time for my MHI coursework in the fall I’ll be a PROgrammer. A few days after I went to Baltimore I drove up to Duluth with two of my good friends for Grandma’s half marathon…. This has been quite the worldwind of a last few weeks! One of my favorite parts of summer is that I can make running fairly high up on my priority list and not feel bad about it. During the school year I wouldn’t be able to sustainably run 50 miles a week and “lift” (in quotes because I don’t lift much) 3 times a week without some serious damage to either school, work or sleep so I relish summer time in that I can run to my heart’s desire. Despite having pretty low expectations for the race since I hadn’t had enough weeks of good training under my belt as I would like, I nearly matched my fastest time ever that I did almost two years ago. I’m running the Twin Cities marathon in the fall so my fitness now definitely bodes well for October 9th! Even though pharmacy school sometimes makes it hard to train as much, or as high-quality, as I want due to not having enough time or feeling sleep deprived, I’m proud of myself for doing a good enough job of maintaining fitness during the year so I can still approach peak shape when I want to for specific races. I credit much of my motivation to work-out during the school year to all of my classmates that I see at the gym doing the same thing! I’m glad to know I’m not the only one that feels that the 1 hour of exercise I lose to my day I gain back in the fact I am a 49014209842190814 times better and happier person because of it. So that is what I’ve been up to. Fun stuff. I’m so glad I have 2 months of summer remaining. After I get back from California, I’ll be doing research at Regions Hospital and participating in the CTSI Advanced Research Program. I’ll also be training for the Twin Cities Marathon with the goals of 1) 2:59:59 or bust 2) recover full function of my lower extremities in 50% less time than last time (so 3 days vs. a week!). Overall, looking forward to the rest of the summer and definitely will be sad when it ends- but looking forward to meet the new PD1s and the fact this will be my LAST classroom year ever… so crazy. Sorry for my late update! I hope you could still remember me, a Chinese girl with full passion and enthusiasm in pharmacy. Last week we finished our first year of pharmacy school, which was too soon to be true. I can still recall the days when I just came here, how homesick I was, how struggling I was, how lonely I was. But after the whole year in pharmacy school, everything is getting better. And my parents will come and visit me during this beautiful summer, so excited! At the beginning of the spring semester, I set several goals for myself. Luckily, at the end of the semester, I made all of them! Firstly, I got the community pharmacy intern position at the Fairview Hiawatha Clinic, I really satisfied with this match. Compared to the busy hospital internships, I prefer the community settings, where I believe I could use my knowledge serve and help the community, the people around me. Thanks for my preceptor Dr. Krier for choosing me! Secondly, I won the Melendy/ Peters’ Summer Research Scholarship under the guidance of Dr. Straka, I will spend this summer doing my project regarding cardiovascular pharmacogenomics through the direct mentor by Dr. Straka and Dr. Roman as well as the Clinical and Translational Science Institute Advanced Pathways to Research Program. I am super excited about the research project! During my undergraduate, I did several research projects of cardiovascular research, after the introduction to pharmacogenomics through pharmacology course, I was fascinated by this charming area, I hoped I could have a chance to know more and learn more in this area. How lucky I was, this dream came true. Thirdly, my grade in this semester is better than last semester, which reflects my hardworking in my courses, keep going, I can make it better in the future! Fourthly, I attended several volunteer activities including Juvenile Diabetes Research Foundation (JDRF) One Walk to raise the awareness of Type 1 diabetes in the efforts of finding a cure, Give Kids a Smile Day which introduced the pharmacy profession to under-served children, Twin Cities Regional Science Fair which evaluated middle school students’ science project presentations. Finally, I was awarded the Best Multicultural Pharmacy Student Organization (MPSO) Member of the Semester, this news really bright my days during the final week! My plan for this summer: I will start my IPPE at CVS from next week, then I will focus on my research program as well as my intern at Fairview till PD2 starts. I am looking forward to experiencing an enjoyable and full summer “break”! As a PD2-TO-BE student pharmacist, I am ready! Congratulations to the class of 2016!!! We made it!!! Through thick and thin we persevered. At times we soared high and at other times we “rode the struggle bus” through long tunnels where we could hardly see the light. With the support of our friends, our family, the staff and faculty of the U of MN’s CoP, and of course our pharmily, we left no hurdle standing in our race to the finish. However, the finish line of this race doesn’t mark the end; rather it marks a new beginning for each of us. As we walk across that stage, we accept the great responsibilities that await us, the responsibility of caring for patients. There is an entire world out there, waiting for the greatness that each and every one of us holds, and I’m confident that as the class of 2016, we will not only deliver but we will excel. During the past four years, I’ve come to know and love a great group of people that didn’t let the distance between two campuses separate us. I’m thankful for every moment I’ve had with each and every individual I’ve met along this journey, and for those that have supported me through every step of the way. At the end of the very long journey as a student, I say congratulations to my peers and give a fair warning to the rest of the world as the class of 2016 is ready to take on any challenge that is thrown our way! Look out world, here we come! Congratulations to the class of 2016! I look forward to sharing every shining moment we bring through our work as the University of Minnesota College of Pharmacy’s newest class of Doctors of Pharmacy!!! I guess I have been pretty bad at updating you on what I have been up to over the last couple months! When did I last post on here? November? December? Anyways, in my family it’s that time of year again-when we all sit down and sharpen our pencils, dust of the typewriter, or open a new word document on our computers. See in my family, since there are so many of us, twice a year we write a round robin letter. We each write one letter, than email/mail it to the designated family member, and they copy them/upload them into one giant PDF which is then mailed/emailed back to us. It is a really great way to stay updated on what is going on in everyone’s life because even with Facebook, texting, etc. it is still difficult to stay caught up. Since the last time I posted on here was about the same time as our last round robin letter, I figured I would just update everyone by posting my letter here instead of trying to update you in several different posts. Enjoy! Attended the annual American Pharmacists Association (APhA) in Baltimore. It was really amazing to learn more about the election process for the national office, get to know my fellow classmates a little better, and learn how to function on very little sleep-especially since I don’t drink coffee. Also learned a lot about health disparities when my classmate walked into a glass wall for a revolving door and broke her nose. The ER experience in Baltimore was a lot different from my ER experiences in the past! Our school also submitted a PharmFlix video (the goal is to promote the profession of pharmacy) this year, and we made it to the top 5 which was exciting since it was the first year we have submitted one. Got to meet the Rear Admiral Pamela Schweitzer!!!!! For those of you thinking, “why is this so exciting?? ?” RADM Schweitzer is the Chief Pharmacy Officer for the US Public Health Service and serves as the Assistant Surgeon General! 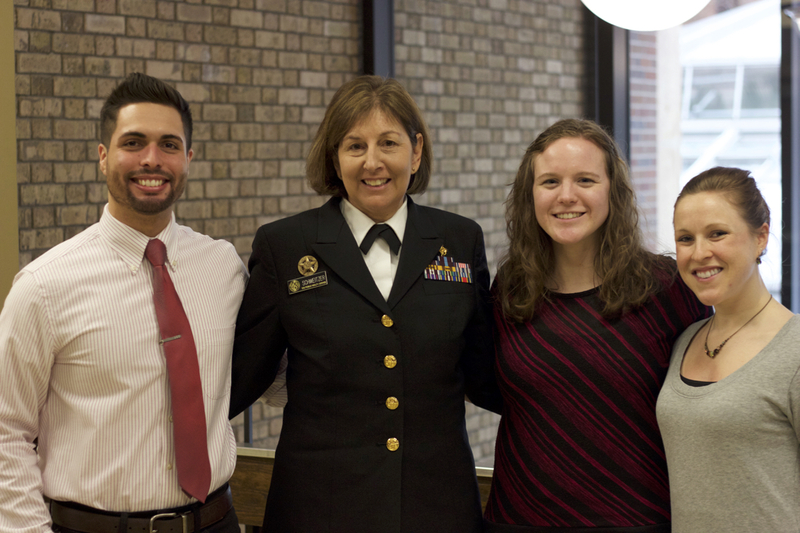 I actually met RADM Schweitzer at APhA briefly, so it was amazing and a great honor to get to meet her again. While she was here, I also got to meet with her along with our SCOA liaison from the Twin Cities, and our MPSA President-Elect to discuss our SCOA group (Student chapter of the Commissioned Officer Association) and how we can further increase awareness of the US Public Health Service and public health initiatives being promoted by the current Surgeon General. 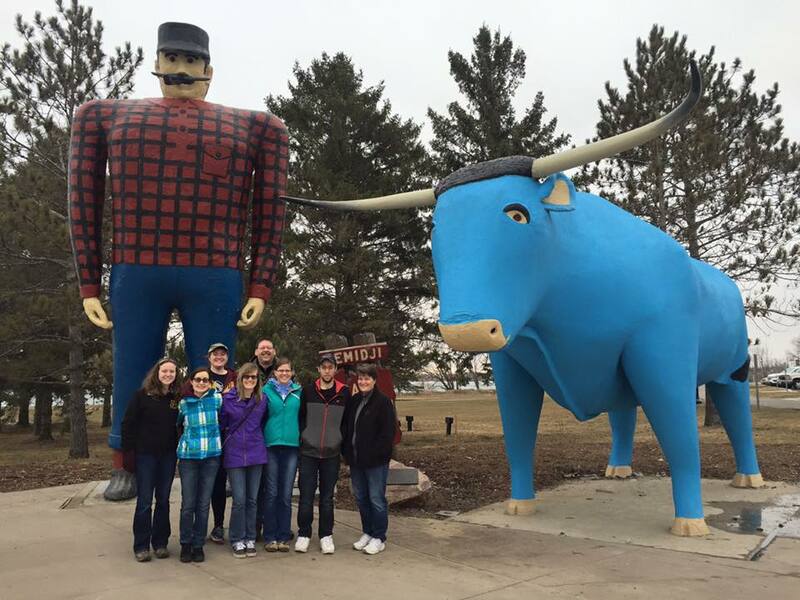 Went to Fargo for the Northern Tier Conference for pharmacists in the commissioned core in Montana, N. Dakota, S. Dakota, Minnesota, and Wisconsin. This was a really fun event and opportunity to hang out with a bunch of the pharmacists from IHS as well as learn more about some of the topics that we have learned about in school this year. In fact, I think I learned more from some of the presenters than I have learned in class, but then again, that could just be because I was paying more attention! Went to Bemidji with the rest of the family and some friends to help my sister celebrate paying off her student loans! Not going to lie, it made me feel a little bit wishful, daydreaming of the day when I will pay off my student loans…when I’m 80 (at least that’s how old I feel I will be when I eventually pay them off)! Participated in the Cultural Competency Competition that was put on by one of our student organizations. We basically worked in groups to come up with a plan to treat someone’s health care needs and who was from a minority and then created a video of our ‘clinic visit’ with them. It was a nice experience to learn more about how to more effectively treat someone who has a lack of knowledge about the health care system, other stressors in their life that affect their treatment, etc. We also got an elective credit for participating, which is always nice! After finals are over in May, a classmate and I will be headed to the USPHS COA Symposium in Oklahoma City (it is basically a big conference for Commissioner Officers). We will be presenting a poster on how SCOA has increased awareness of the USPHS among the pharmacy students at the UMN. Thankfully, my sister is letting us crash at her place so we can split up the 14 hour drive. It has been kind of fun to dig into the data showing that we have increased awareness and interest in the commissioned core since we started the group. After returning from Oklahoma, I will be headed to Fergus Falls for my Intro to Hospital Pharmacy rotation this summer. The rotation is three weeks and I will be staying in the dorms at the Community College there. After Fergus Falls I will be heading to PARKER, ARIZONA!!!!! If you can’t tell, I am just a little bit excited 😀 I will be doing another JRCOSTEP there, and I am also hoping to do some major traveling on the weekends to do some fun day hikes, despite the average summer temperature being over 100 °F. Also hoping to finally see the Grand Canyon, and hopefully it isn’t foggy like when my cousin went for the first time! Anyways, time to get back to studying….